Physics is the study of matter and energy and how they interact. Physics helps us understand how the world, and everything in it, really works. Physicists study all aspects of nature—from the study of subatomic particles to the study of astronomical objects many times larger than the sun. You will discover the particles that make up the universe and the forces with which they interact. You will learn about black holes, atmospheric phenomena, new materials, quarks and gluons. You will investigate such phenomena as the big bang, quantum mechanical paradoxes and superconductivities. You will experiment using telescopes, satellites, radar, tokamaks, synchrotron and particle accelerators, and conduct space weather observations and atmospheric ozone monitoring. This laboratory course explores basic elements of electric circuits and electronics through experiments. Students will also learn how to measure magnetic fields through inductance and Hall probes. There will be five experiments and students will need 1.5 hours per experiment. For each experiment there will also be a 1 hour lecture. The Schrodinger equation and its implications are discussed for several important quantum systems, including the quantum harmonic oscillator and one-electron atoms. Further topics include barrier-penetration, angular momentum in quantum mechanics, spin, and time-independent perturbation theory. The tutorial will develop problem solving skills and techniques using modern tools. An introduction to the physics of the nucleus and of the fundamental particles and their interactions. Topics in nuclear physics include nuclear phenomenology, radioactive decay, nuclear reactions; nuclear models: semi-empirical mass formula, shell model, collective models, the deuteron and the nucleon-nucleon interaction. Topics in particle physics include strong and electroweak interactions; global and local symmetries of the weak and strong interactions; the neutral Kaons and CP violation; Feynman diagrams; the Standard Model: quarks, gluons and colour; decay and reaction probabilities; hadron production; meson and baryon masses; charmonium; asymptotic freedom; neutrino oscillations. You can complete up to 16 consecutive months of supervised work experience with a sponsoring employer in addition to the requirements for a Physics program. Normally, the work placement commences after you have completed three years of a four-year degree program in Physics. The placement typically lasts from May 1 of one year to August 31 of the next year but shorter internship placements of 4, 8 or 12 months may also be allowed. We are home to the Canadian Light Source - the only national facility for synchrotron light research in Canada and the fourth most powerful synchrotron in the world! Physicists come from around the world to do work in such areas as the structure of biological molecules, micro-sensors and micro-machines, and environmental science. Faculty members are involved in collaborations with international institutions and laboratories in all of the research areas represented in the department and are awarded over $5 million in external research funding each year. Department members have been recognized, nationally and internationally, receiving such awards as the IEEE Nuclear and Plasma Sciences Award and the NASA Group Achievement Award. 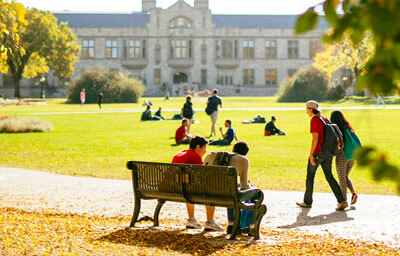 The department has also been home to several Canada Research Chairs. The department values teaching excellence and instructors are committed to providing a stimulating and friendly learning environment. Instructors in the Department have been recognized with the uSask Master Teacher Award and the USSU Teaching Excellence Award. You can apply for an exciting summer opportunity to collaborate in a research project with the Natural Sciences and Engineering Research Council of Canada (NSERC) Undergraduate Summer Research Award. You should consult with an academic advisor in the college when you begin your studies to decide if you want a four-year, three-year or honours degree or would like to pursue the Professional Internship Option.